One of the Gold Standard projects our customers have helped to support is in Kasigau in Taita-taveta District of the Coast Province, Kenya. A Gold Standard, quality carbon reduction program, has to deliver significant social and welfare benefits to the community. Our time in the communities has revealed new and surprising additional social change. As is the case in many parts of East Africa, life in rural Kenya has very specific gender roles and traditions. The kitchen is the principal place for the African woman alone. The kids occasionally come in, either to help with a few kitchen cooking chores or to get a share of their meals. The male partners completely avoid the place and take their meals away from the kitchen. However the introduction of the new clean stove technology form co2balance is starting to change these long held positions. Prior to the new stove introduction the kitchen was always filled with wood smoke and ash. When preparing meals with the traditional three stone fires, the clothes of the user always get smoky and spotted with ash. This environment could not be tolerated by the African men who are, according to the traditional and cultural perspective, very much the head of family. The situation is explained in his own words by Mr Mzee Bedford Muinde, a resident in the Kasigau project area. “I could not imagine helping my wife with the kitchen cooking chores because my clothes could become smoky and dirty. When I attend the wazee’s evening baraza’s (old men’s evening discussion forums) they could mock me saying that my wife had taken my role as the head of the family because of my smoky and dirty clothes. 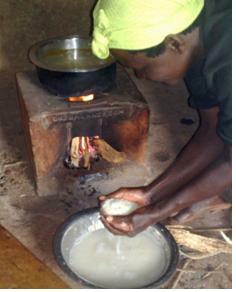 The smoky and ashy clothes are normally associated with women because of their kitchen chores which involve cooking with the smoky traditional jiko. I completely avoided the kitchen to save myself from this embarrassment”. After installation of CarbonZero stoves the situation has dramatically changed. There has been an increase in the involvement of male family members in kitchen cooking chores in a near smokeless kitchen as Mrs. Muinde’s explains. 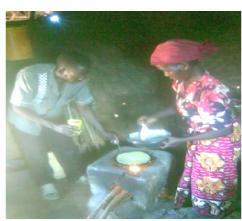 “Since I benefited from the CarbonZero stove donation, my work has become easier. My husband has started lending me a hand in the kitchen. He no longer fears that his clothes will become smoky and dirty since the CarbonZero stove is far much less smoky as compared to the traditional jiko. Now my husband, when not busy with other family chores, can stay in the kitchen and help me. He can help me with cooking and still in the evening attend wazee’s baraza with great ease. When I am preparing chapatis, I roll the dough of which I am a champion while my husband prepares (cooks) them on the pan of which he is proving to be a great expert. With two people chapati cooking is now easy. Oh! Life will never be the same again, thanks to the CarbonZero stoves”. Based on this encounter, not only are co2balance providing beneficiaries with energy efficient and clean cooking stoves but also impacting positively in their social lives. Involvement of the male partners in routine kitchen cooking chores reduces the workload for the women, giving them time to rest and also engage themselves in developmental issues that affect the wider community. Family harmony and unity is enhanced as partners spend more time as a couple and with the children as a family. What used to be a social unit in theory is now a social unit in practice.